https://matcha-jp.com/en/3545 Sapporo Travel Guide – Sightseeing, What To Wear, Local Food, And More! Sapporo - the capital of Hokkaido. Enjoy rich nature, great cultural and historical sites, and amazing food regardless of the season. Use this travel guide to find the best places to visit in Sapporo, information on local weather and other travel tips. Sapporo - What Kind of Place Is It? Sapporo Snow Festival – a famous Sapporo event. Hokkaido is Japan's northernmost region. Sapporo is the center of this island’s politics, economy, and culture. The charms of this city include amazing gourmet foods such as fresh seafood, ramen, and Jingisukan (grilled mutton) as well as picturesque scenery that enchants visitors each season. 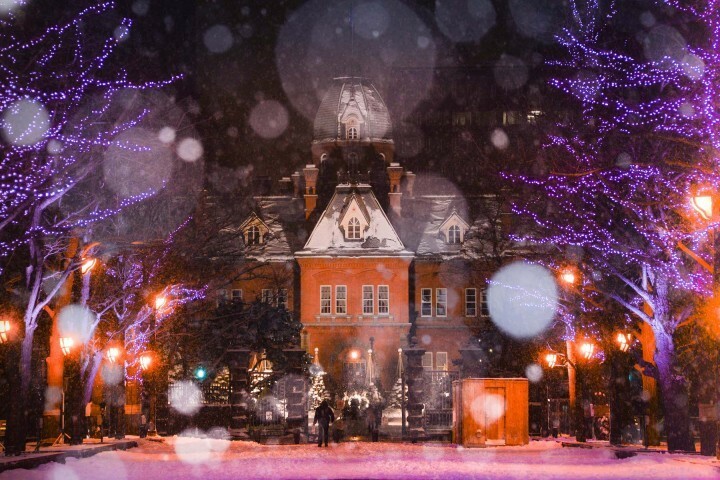 In this article, we’ll give you a thorough guide on essential information for your Sapporo travels - from 10 spots you must visit when going to Sapporo to recommended foods and what to wear each season! Sapporo is a vibrant city whose charms include historical attractions, an entertainment district bustling with people, and a famous public park and more! In the area near Odori Park, which extends across the central east-west part of the city, there are structures with a long and fascinating history such as the Red Brick Office (Former Hokkaido Government Office Building), Clock Tower, TV Tower, and more. The Susukino area nearby is a night spot nicknamed the “district that doesn’t sleep”. The district also has food spots where you can eat the Sapporo specialties such as ramen, Jingusukan, and zangi (fried chicken). When you gaze at the streets of Sapporo at night from Mt. Moiwa, which is located a slight distance from the city center, you’ll have your breath taken away by the beautiful night view that spreads out before you. You can also soak in hot springs surrounded by the beautiful scenery of the seasons by making a visit to Jozankei Onsen. The Sapporo Clock Tower is a building considered the landmark of Sapporo. It was been built in 1878 as a lecture hall for Hokkaido University (known as Sapporo Agricultural College at the time) and is currently a designated Important Cultural Property of Japan. The Clock Tower, from which the sounds of the chiming bell will echo across the city every hour and is beautifully illuminated come nighttime, has been adored for a long time as a symbol of the city that silently watches over the citizens. * Due to repair work, the tower will be closed from June 1st to October 31st, 2018. The Red Brick Office is also a landmark that represents Sapporo. It is a building that had previously been used as the former Hokkaido Government Office Building. The building was constructed in 1888 and is characterized by a design made in the Neo-Baroque style, which is modeled after the Paris Opera, in an American-like fashion. The building is open to the public for free and exhibits historical records. When In Sapporo, See The Former Hokkaido Government Office Building! If you come to Hokkaido, then definitely please try the fresh seafood! At Nijo Market, a market with over 100 years of history, you can thoroughly enjoy seafoods such as freshly caught sea urchin, salmon roe, and crab to your heart’s content. The atmosphere of the market, recommended shops, and more are introduced in detail in this article: Sapporo’s Nijo Fish Market – Easy Access And Tasty Seafood! Horomitoge Lavender Garden in Sapporo is famous as a garden where 5000 lavender flowers are sweetly in full bloom. The best time to see the flowers are within the one month period between the middle of July to the middle of August. You can also experience harvesting the lavenders in the garden (price: 500 yen). For details on how to access the garden and more, please read the following article: Sapporo’s Horomitouge Lavender Garden Is Just Too Beautiful!. Sapporo's Horomitouge Lavender Garden Is Just Too Beautiful! Sapporo is so famous for the beauty of its night views that it has been recognized as one of Japan’s Three Major Night View Spots. Among those is the view from Mt. Moiwa, a mountain that looks over central Sapporo. You can visit the summit of the 531 m high mountain by using the ropeway and cable cars. Definitely please enjoy the beautiful Sapporo night view which is often described as a “carpet of light”. Access: If traveling from Sapporo Station, first take the tram and exit at Ropeway Iriguchi Station, then walk for 10 minutes or take the free shuttle bus to Mt. Moiwa Sanroku Station. From there, take the ropeway. Susukino is an entertainment district that represents Hokkaido and is an area crowded with restaurants, recreational facilities, hotels, and more. It has also been described as the “district that doesn’t sleep” and is overflowing with as much as 80,000 people at night. There are no problems with public safety in this area but be sure to be careful of pickpockets and panderers. Susukino may have a strong night image, but the area is also home to a shopping district called Tanukikoji Shopping Arcade where you can enjoy shopping in the afternoon. Shiroi Koibito is a well-known Hokkaido confectionery made with white chocolate sandwiched between two cookies. Factory tours are held for tourists at the Sapporo Shiroi Koibito Park. * Visitors will be unable to observe a portion of the production line from April 1, 2018 to March 2019 due to renovation work. For details, please check the official website. Hokkaido Jingu, built in 1869, is known as a representative shrine of Hokkaido. Here is where the gods that protect the land of Hokkaido are enshrined. Approximately 1400 cherry blossom trees have been planted on the grounds, making the shrine a flower viewing spot in the spring. If you’ll be visiting Sapporo during the spring, why not try enjoying a flower viewing together with a shrine visit? Moerenuma Park, designed by master sculptor Isamu Noguchi, is a park full of artistic qualities built on the former site of a waste treatment plant. This special space unites nature with art and has charms that vary each season. For details, please read the following article: Moerenuma: A Beautiful Park Designed by Isamu Noguchi. Jozankei Onsen, located in the outskirts of Sapporo, is one of Hokkaido’s representative hot spring districts. You can spend your time comfortably and luxuriously by staying at a hotel or ryokan (traditional Japanese inn). There are also spots where you can find day trip hot springs, free footbaths, or make onsen tamago (eggs boiled in hot springs) using the spring source. This spot is also famous for its autumn leaves. You can enjoy the leaves while riding a canoe come autumn (canoe activities are available from the end of June to October 31st). Access: A direct bus will be operating from Sapporo Station. It is 770 yen one-way (390 yen for children). Travel time is 75 minutes. For details on bus stops and timetables, please check the bus company’s official website. Sapporo is a place famous for its delicious local foods. These include not only fresh seafood, but also ramen and Jingisukan. Here, we’ll introduce four representative Sapporo foods. As one of Sapporo’s gourmet foods, we must not forget about seafood. You can taste fresh and fatty seafoods in Hokkaido where they boast the highest fish catch in the country. You can eat fresh seafood bowls made with abundant amounts of sea urchin and salmon roe from around 6:00 in the morning at markets such as Nijo Market and Jogai Market. We recommend visiting these markets in the morning due to the long lines at shops during lunch. Sapporo is where a huge number of ramen shops are located, enough that it is not an overstatement to say that it is the second most competitive ramen market in Japan after Tokyo. What Sapporo is particularly famous for is their miso ramen (pictured above). Miso, vegetables, as well as dashi stock are poured into a wok and are then stir-fried at a high heat to create a uniquely flavored miso ramen. Jingisukan (named after Genghis Khan), a specialty Sapporo gourmet food, is a grilled mutton dish made with a special nabe pot. The most common style of the dish is to fry various vegetables together with the meat. Jingisukan is nutritious and can be enjoyed at a reasonable price; it’s one dish you definitely must try when you visit Sapporo. There are countless types of curry dishes around the world, but the soup curry was created here in Sapporo. Its features include a thin, clear soup and a noticeably large serving of vegetables. Depending on the curry, you might also receive large pieces of meat like chicken with a satisfying substantiality to the dish. Its spicy aroma will stimulate your appetite. It’s most convenient to travel by plane from Tokyo to Sapporo. It will take one hour and 40 minutes to two hours one-way from Haneda or Narita Airport in Tokyo to New Chitose Airport in Sapporo. Prices start from about 6000 yen (will depend on the time period and airline). It will take 40 minutes by Rapid Airport from New Chitose Airport to Sapporo Station and will cost 1070 yen. It takes approximately 65 minutes by bus and will cost 1030 yen. There is also the option of traveling to Sapporo by bullet train from Tokyo Station to Sapporo Station. However, it will take about eight and a half hours one-way, including transfers, and will cost at least 27,000 yen so it is the method that we would least recommend. If you’ll be traveling around sightseeing spots in Sapporo, we recommend taking the Sapporo Municipal Subway that connects central Sapporo to other parts of the city. The cost of each section covered by the subway is around 200 to 370 yen, but if you purchase the “One-Day Ticket for Subway Use”, you will have unlimited rides on the subway for an entire day at 830 yen for adults and 420 yen for children. Additionally, a more advantageous unlimited ride ticket called “Donichika” is also sold for those that are visiting Sapporo on Saturdays, Sundays, national holidays, and during the New Year’s holidays (December 29th – January 3rd). This ticket allows unlimited rides for the entire day at 520 yen for adults and 260 yen for children. Do utilize this ticket if you’ll be traveling to Sapporo on a holiday. Aside from subways, there is also rail transport, buses, and trams that are in operation in the outskirts of Sapporo. It is useful to utilize the tram (city streetcar) in the area to the west of central Sapporo where the subway does not run. If you’ll be traveling to the outskirts of the city, please take in and enjoy the nature of Sapporo from the windows of the train. Sapporo in the spring still remains quite chilly when compared to Honshu (the main island of Japan). As such, we recommend bringing outer garments such as coats and clothing to protect against the cold like a muffler and gloves. In March, the snow will begin to melt and the snow will have mostly melted away once it’s April. Meanwhile, there will be days during July and August when the temperature exceeds 30°C. However, it would be best to prepare long-sleeved clothing even in the summer due to the dropping temperature at night. When it’s October, the average temperature will fall below 12°C and come early November the snow will begin to fall. From November to February, the days where it is below freezing will increase and roads covered in snow will become slippery. If you’ll be visiting Hokkaido in the winter, make sure to protect yourself against the cold and prepare boots that are easy to walk in. When you think of the most famous event in Sapporo, the Sapporo Snow Festival held in early February each year will come to mind. Art creations made by carving and sculpting snow is something you must definitely try to see at least once. Tourists from all around the world gather for this event where warm Hokkaido foods perfect for the cold season are also offered. The main venues will be at Odori Park and Susukino in central Sapporo. We will introduce a recommended course for those who would like to enjoy the best things to see and do in Sapporo. In other words, how about going around the main sightseeing spots in Sapporo on day one, then spending a relaxing day on day two by healing through nature and hot springs? There are various types of lodging facilities available in Sapporo from the typical hotel to well-established Japanese inns and guest houses. Sapporo Grand Hotel, a hotel right by Sapporo Station and Odori Park, has a convenient location and is reputed for their high-quality services. All rooms at Nakamuraya Ryokan, an established Japanese inn founded in 1903, are Japanese-style rooms. The inn has garnered popularity among foreign visitors as a Japanese inn brimming with a historic atmosphere. We recommend this inn to everyone who will be sightseeing within the city for its close location to Sapporo Station. At SappoLodge, a representative Sapporo guesthouse, you’ll find various types of rooms such as dormitories and private rooms. You can also interact with other travelers or enjoy a drink in the adjacent café bar on the first floor. ROYCE’s Chocolate Potato Chips are super popular as a Sapporo souvenir. It is a chocolate-coated potato chip snack with the perfect balance of sweetness and saltiness. Shiroi Koibito, a confectionery of white chocolate sandwiched between two cookies, is one of Sapporo’s staple souvenirs. You can easily buy this product at souvenir shops in department stores and stations. Its aqua-colored packaging is a trademark known by every Japanese person. Enjoy Your Trip to Sapporo! Sapporo has no lack of sightseeing spots and gourmet foods. Do make travel plans to enjoy and experience Sapporo to the fullest!